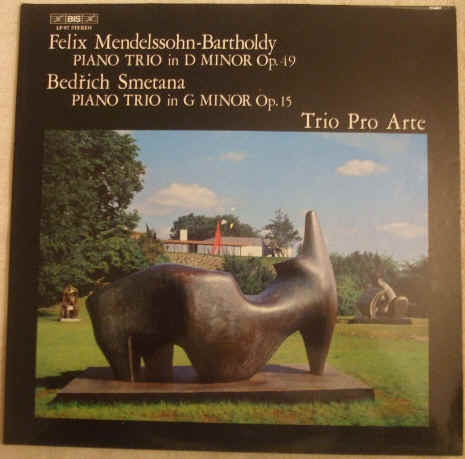 33rpm LP Record of MENDELSSOHN SMETANA PIANO TRIO in D minor and G minor, featuring the Trio Pro Arte (Elisabeth Westenholtz, piano; Milan Vitek, violin; Pierre Rene Honnens, cello). It was issued on the stereo BIS label in 1977. Catalogue number: BIS LP-97. German pressing. The record itself is graded better than excellent, with no discernible surface marks when viewed under normal house lighting. Superb sound quality, with NO jumps, ticks, pops or crackle. Just about faultless playback. The gatefold sleeve is graded excellent, with no signs of wear apart from some light age browning on the inner part, although no text is seriously affected. The plain inner sleeve has no wear to speak of.